Where is the Arizona Mineral Collection? Following the hostile takeover and abrupt closure and destruction of the Arizona Mining and Mineral Museum, many have wondered where the Arizona mineral collection is. They cannot be comforted by recent developments. The AHS recently published a three page Annual Report. It contains two letters, a membership list, and two small financial pie charts. The letter from the Director contains the following paragraph. in all corners of the state. So, apparently the answer is that the mineral collection is being scattered across the state. This, combined with finding of recent Auditor General reports, is worrisome. As reported in the 9/13/2003 blog post and on page 29 of the Performance Review cited in the 10/11/13 blog post, the AHS has inventory control issues. Some collections have not been audited for over 14 years. The value of quality museums to education seems to be accepted common knowledge. Prior posts on this blog have cited references supporting the idea. Below are two more such related references. The second reference describes a new City of Phoenix program called Phoenix Great Start pilot program. It will provide free admission to selected quality museums in Phoenix for some low income school districts. In support of that program, Mayor Greg Stanton said; “A child’s earliest experiences in life are important for their long term wellbeing. We know that”. Eight museums are approved for inclusion on the Great Start museum list. Why is the Arizona Historical Society Museum not on the list? Arizona has spent tens of millions of dollars on that museum. Why it is not a quality educational museum? If it still existed, the Arizona Mining and Mineral Museum would most probably be on the list. School buses used to appear daily at that museum and teachers considered it a vital resource. That museum already allowed free entry to children, but Great Start funds might have been used for transportation for low income schools that have no field trip budget. Following a contentions public hearing, the Arizona Senate voted to transfer the mineral museum to the Arizona Historical Society. The AHS then closed it and destroyed it. Funds were not an issue. So, given tens of millions of tax dollars, the AHS has not produced a museum with recognized educational value. Given a top rated museum with recognized educational value, the AHS destroyed it. 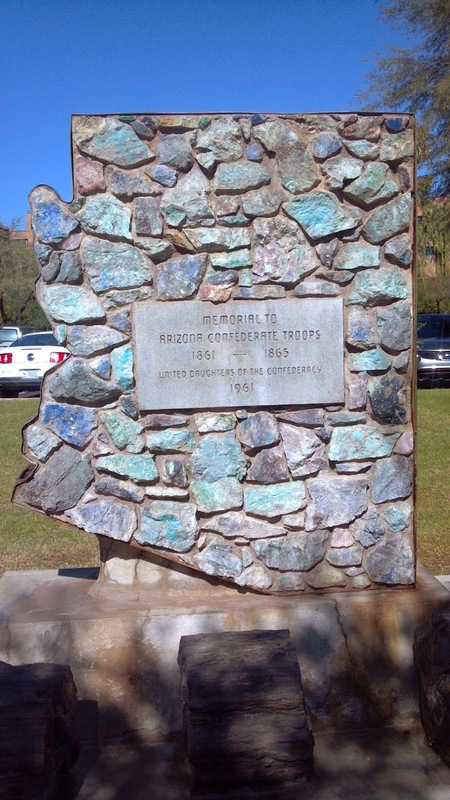 A variety of monuments surround the Arizona Capitol building. Many feature Arizona rocks. 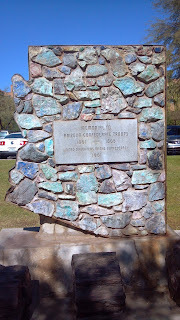 Among them is an Arizona shaped monument made of copper ore bearing rock, and one displaying petrified wood (see below). Copper bearing rock and petrified wood are both prominent features of Arizona’s unique geology. A significant part of Arizona’s past, the once top rated Arizona Mining and Mineral Museum, was not only forgotten but destroyed as part of misguided centennial celebration preparations. 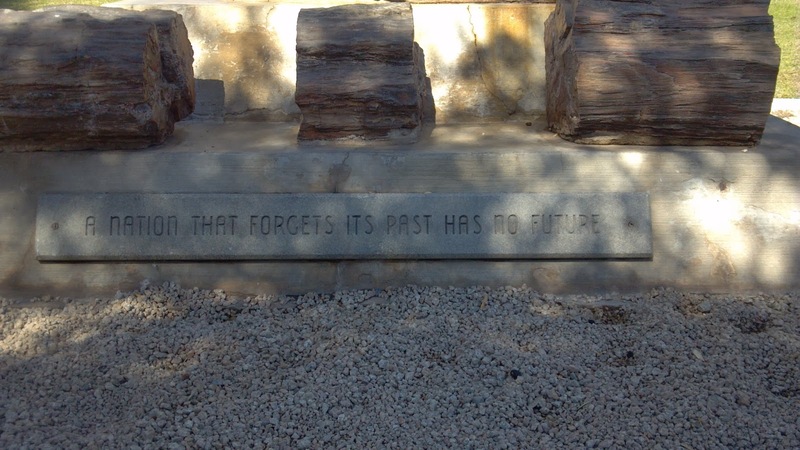 The destruction was done by the Arizona Historical Society. Compounding the madness, the replacement, the Arizona Experience Museum, was to feature the future. The result is an empty building where students once learned about Arizona’s unique past nearly every school day. A hidden past and no future?